← Casey Mayes. A Killer Column. New York: Berkley Prime Crime, 2011. Lisa Williams Kline. Summer of the Wolves. Grand Rapids, MI: Zonderkidz, 2012. Stephanie and Diana are like night and day: blonde Diana loves the outdoors, and gets along with animals better than people. Dark-haired Stephanie is artsy, social, and fashionable. Each regards the other’s world as alien to her own. Unfortunately, Stephanie’s dad and Diana’s mom have just gotten married, and the two new stepsisters are pushed into a “family” vacation at a ranch in the North Carolina mountains. Stephanie is horrified that she’ll be expected to participate in activities like trail riding and white-water rafting, while Diana is angry that she’ll be held back by her stepsister’s reluctance. Stephanie actually wants to be friends, but Diana is so angry that civil interaction is barely possible. With the family shift weighing down on both of them, the vacation does not start well for the girls. Stephanie nearly falls off a horse, and Diana is even more annoyed when her socially skilled stepsister starts making friends with other children right away. But then Diana discovers the wolves: two part-wolf, part-dog hybrids that a local man keeps for show. Diana’s heart goes out immediately to the skinny, frightened creatures, who are kept in a small pen with little food or water. She determines to free them, and when Stephanie catches wind of her plan, the usually cautious brunette decides to help Diana. Together they free the wolves, but their actions have far-reaching consequences that they didn’t consider. 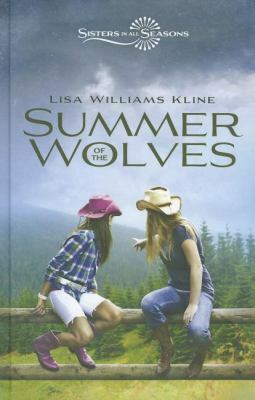 The girls must help those who wish to bring the wolves safely home, realizing along the way that they’re more similar than they thought.